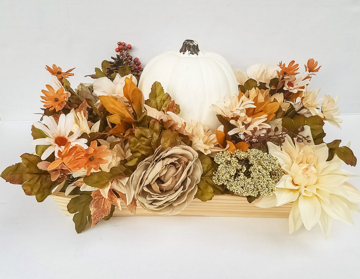 Fall is a great time to get creative with your flower arrangements! 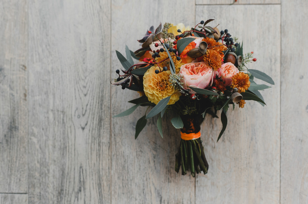 Whether you include fall wedding decoration ideas like sunflowers to create a beautiful display, or you choose to go with deeper reds and oranges, a rustic fall bouquet is a great addition to your fall wedding! Adding height to your fall wedding table decorations can make your reception feel more colorful and exciting! Using branches or wheat with various types of flowers can create a stunning centerpiece for all of your guests to enjoy! A popular activity for a fall wedding is a bonfire at the reception! Guests will love to sit on a hay bail while roasting a marshmallow to make the perfect s’more! Bonfires are great for keeping guests warm and creating a delicious and fun activity. Pumpkins are the perfect fall wedding reception decor, as they can be used in many ways to add color to your centerpieces or other decorations! A pumpkin accent helps your wedding feel more rustic during the fall season! 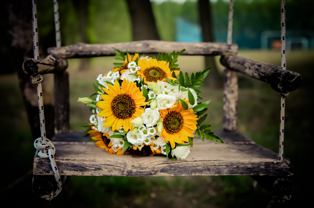 Outdoor weddings can be great during the fall season, as the weather is ideal for an outdoor ceremony. Using fall decor such as pumpkins and fall flowers creates a beautiful place to say I do!